Вы можете выбрать из 100 различных игровых типажей. Постараемся немного описать каждый параметр характера. Каждая характеристика будет меняться с течением времени. Ведь даже в игре вы стареете. Photo: If you want to gain a quick impression of a character without looking at his values, look at his photo. Pictures can speak louder than words. However, try not to go solely by appearances: some characters have hidden talents. Name: At the beginning of the game, names can be changed. During the game, however, you must stick to the name you have chosen. Money: This is the initial capital that the character has to his name. However, it is not the most important criterion at the start of the game. Obviously you will find it easier if you star off with 10,000 Dollars rather than 5,000, but the other character values represent long-term assets that should not be underrated. Age: Your character will age in the course of the game - with each passing year in the game he will grow one year older. The older you are, the slower your health regenerates - if you are older than 100 years it will not regenerate at all. Popularity: This value determines your position in society. The higher the value, the easier it will be for you to establish contacts with business partners. Value 100: you are everybody's darling and they are all falling over each other to do business with you.Value 0: you are an absolute outcast. Nobody wants to have anything to do with you. Health: This value represents your vitality, i.e. your ability to regenerate used energy. Value 100: you are fighting fit and full of health. Value 0: you are on your last legs and cannot renew used energy. Energy: Your daily working hours depend on this value. The higher it is, the more actions you can perform in a day (and the more responsibilities you have to shoulder, the shorter the days will seem). 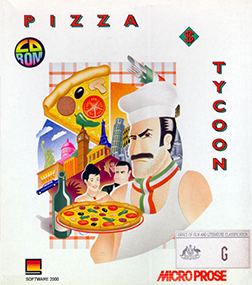 See also: A DAY IN PIZZA TYCOON. Value 100: you can move mountains and are bursting with energy. Value 0: "Hey! Wakey wakey!" Intelligence: This value is most important for your computer-controlled opponents. You will probably use your own rather than your character's intelligence. The intelligence value determines how rational and reasonable the decisions of your computer opponents are. Value 100: you are a faultless robot. Value 0: "Who am I?" Charisma: This refers to the impression you make on other people. If the value is high, you are more likely to achieve positive results in any chance event connected with business negotiations. Value 100: you are Miss/Mister Universe. Value 0: you are Frankenstein's Monster. Dexterity: This value tells you how quick you are. This is most important in the action sequence. There your dexterity value determines how fast you can move your character. It is also vital when it comes to shady deals. If you are nimble and dexterous, the police will have a job catching you. Value 0: you get overtaken by passing snails! Personality: The higher this value is the better you are at convincing business partners of your opinion. Value 100: "Here's looking at you, kid." Value 0: "Forgive me for living." Cookery: Again this value is of main importance for computer-controlled opponents. 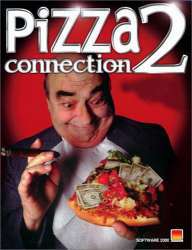 It determines how good the food is and how well the character will do at pizza competitions. Value 0: "Pitsa? Do you mean that funny round stuff?" Courage: Decisive for your relationship with the underworld. The higher this value is, the easier it will be for you to get a reputation in this harsh environment and to be taken seriously there. Value 100; you're a tough cookie and nobody messes with you if they can avoid it. Value 0; The mere sight of a toy gun would make you flee the country! The character values affect the situations and probability factors in the game, but remember; the biggest influence on the course of events is YOU.